"It is in the best interests of the president to get rid of these problems now." The COB of the Center for Prevention of Corruption and a the Reanimation Package of Reforms board member, Vitaliy Shabunin, says that President Petro Poroshenko is personally responsible for the selection of new Supreme Court judges. Speaking at a joint round table conference of Gorshenin Institute and the Reanimation Package of Reforms, Shabunin would not rule out that the Supreme Qualification Commission of Judges, which conducts the competition, may pass some odious candidates. 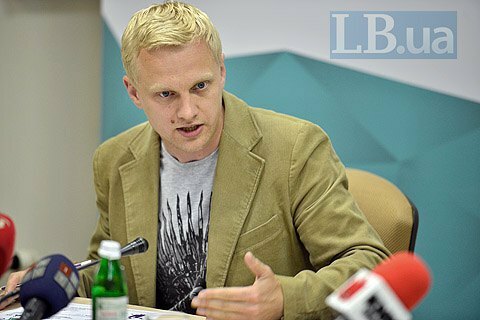 In his opinion, such candidates are the current chairman of the Supreme Court Yaroslav Romanyuk and head of Kyiv's District Administrative Court Pavlo Vovk. "The president, who is the author of this reform, will put the final signature under the appointment of people like Romanyuk, Vovk etc. It is in the best interests of the president to get rid of these problems now rather that have to approve them later. It that case, it will be his personal responsibility, not just political, for the appointment of these judges," Shabunin said. The job contest in the Supreme Court, conducted by the Supreme Qualification Commission of Judges, consists of several stages: testing, practical case, psychological tests, and examination of a judicial dossier. The Qualification Commission, according to the law, recommends the winners of the contest to the Supreme Council of Justice for the posts of Supreme Court judges. In turn, the Council submits the candidates for the appointment by the president.